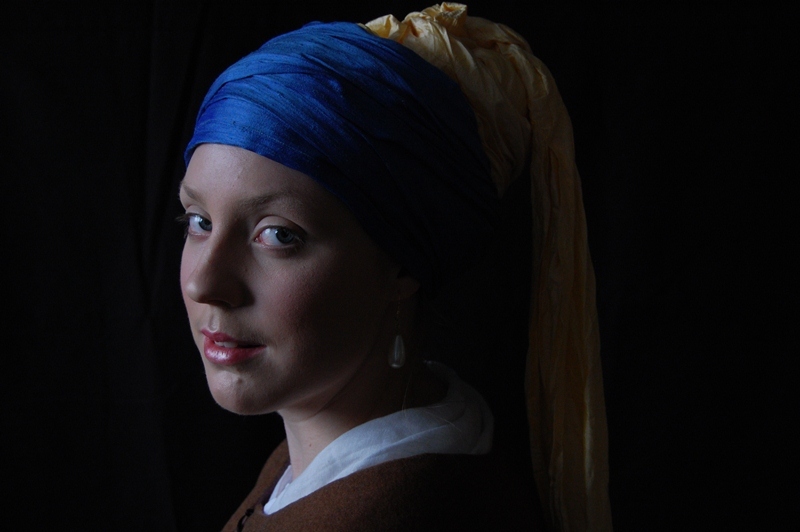 Girl with a Pearl Earring, by Johannes Vermeer. 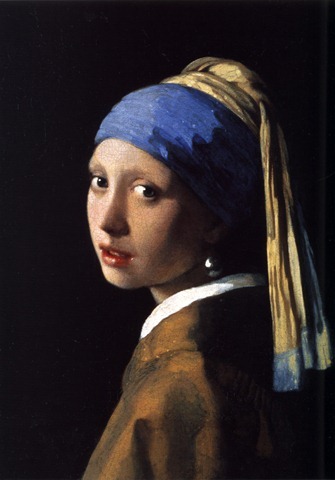 ‘Recreating Johannes Vermeer’s iconic and enigmatic painting Girl with a Pearl Earring was an irresistible temptation. In fact I had been considering this for some time and had already collected a number of yellow and blue silks that were tucked away safely somewhere in my textiles stash’. I had the pleasure of seeing the painting in person when my husband and I visited The Hague a few years ago. The painting is housed in the Koninklijk Kabinet van Schilderijen Mauritshuis, Den Haag, and it was a pleasure to see it in person. The painting is oil on canvas, 46.5 x 40 cm in size and has been dated to the period 1665 to 1667. For the purposes of our project we took the date to be 1666. As we couldn’t refer in person to the original Vermeer painting we had to rely upon reproduced images which varied considerably in the colour tones – the blue varying from turquoise to cornflower blue, for example. The decision on which version was the truest was made by the director, Nick Loven, on the basis of which most reflected natural skin tones. We then had to test the selected silks on camera for colour saturation and chose the ones which best matched the original on screen rather than by the naked eye. 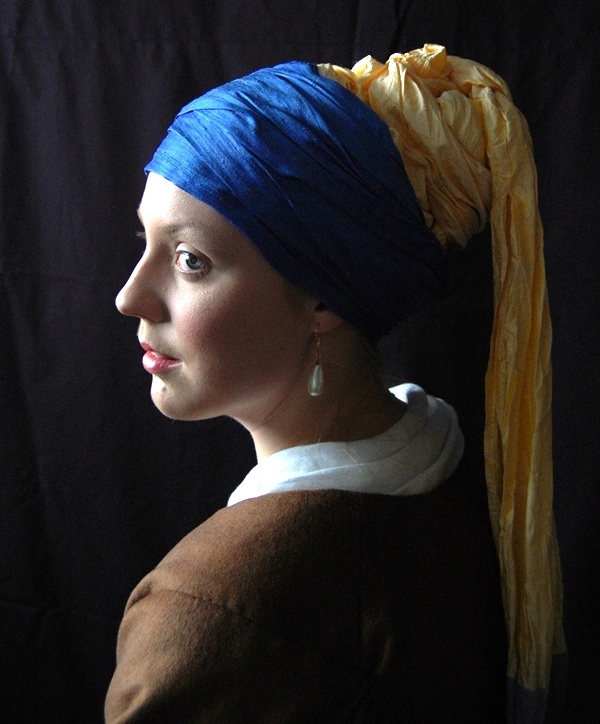 I created the turban from a length of yellow silk taffeta that was 5 metres long and 31 cms wide. For most of the length I made it a tube for manageability, keeping half a metre or so at each end open to show the edge trim. Close scrutiny of the painting suggests that the blue trim was possibly a fringe. However, a painted version of a fringe is subtle whereas using an actual fringe just looked wrong. In the end I created a border using a band of the blue silk from the turban, covering it with a sheer, ivory coloured silk. I then hand-washed and twisted the silk to give it the look of the textile in the painting, paying particular attention to the edging, which I crushed to give the appearance of fringing. I used a piece of blue silk dupion, 1.38 by 36cms, for the final part of the turban, as its texture would help grip and hold the whole headdress in place. However, it still took me a week of studying how turbans were tied and experimenting until I could reproduce the twists and knots of the original in a way that I could repeat on the day and that wouldn’t just fall off! Only part of the Girl with a Pearl Earring’s shoulder and upper arm can be seen in the painting and the full details of her clothing are hidden. I felt that the textile for her top was most likely wool, but of a good quality and possibly with a polished sheen to the surface as it reflects many colours. I consulted a number of costume friends and contacts and they agreed too that it was more likely wool than silk. It took me six months to find suitable wool with the right colour tones and a slightly polished surface. In the end I found it on a fabric stall (Bernie the Bolt) on a re-enactors market. The shift and possibly kerchief that we see at the neck would have been linen. If you look carefully at the painting you can just make out at the back of the sleeve a series of cartridge pleats which help set the sleeve into the armhole. In order to get more of an idea of the likely cut of the jacket, I studied many of the Dutch paintings made around 1666. I also used the book ‘The Cut of Women’s Clothes 1600-1930’ by Norah Waugh for guidance. With a tailor’s dummy dressed in the correct shape foundation garments and of the correct size I cut a toile (pattern) for the wool jacket. As with most of Vermeer’s paintings, the sitter for The Girl with a Pearl Earring remains unknown and I didn’t want to make any presumptions about her status or be influenced by Tracy Chevalier’s book and the film, starring Scarlet Johansson, based upon it. I just wanted to study the painting and to let it speak for itself. However, having gone through the process of analysis and recreation, I am inclined to regard Tracy Chevalier’s interpretation as rather clever!